On Friday, Dish Network and Blockbuster held an event called “A Stream Come True,” where many assumed the two companies would finally reveal what they’ve been working on since the acquisition five months ago. How would Dish revive Blockbuster, a badly bruised brand, to compete in such a crowded and competitive space? That sounded promising enough–and most media outlets took the bait, predictably (and almost mechanically) spewing out the same tired, cliché story line in giving Blockbuster a second chance: “Netflix beware!” yelped Entertainment Weekly. “Dish Network [and] Blockbuster gang up on Netflix,” wrote The Washington Post. “Dish Network goes after Netflix,” said the Los Angeles Times. But what Clayton actually unveiled wasn’t a worthy Netflix competitor, but, as Deadline Hollywood put it, a “letdown.” Dish Network “blew a golden opportunity to seize the momentum from Netflix,” argued Deadline editor David Lieberman. Here’s why. 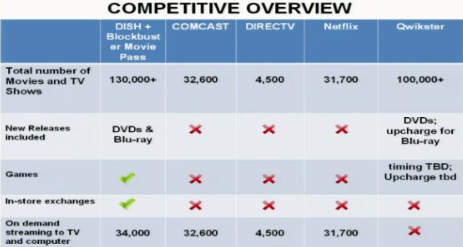 In order to subscribe to the plan, called Blockbuster Movie Pass, consumers will have to subscribe to Dish Network. That means selecting one of Dish’s cable packages–the company recommends the “America’s Top 200” plan, which actually includes 220 channels for $39.99 a month. From there, members can add Blockbuster Movie Pass (starting at $10 a month) to gain access to DVDs by mail (one disc at a time) and streaming content, for roughly $50 per month in total. In reality, you’ll have access to about 3,000 movies and TV shows available by television from Blockbuster–if you have a set-top box. 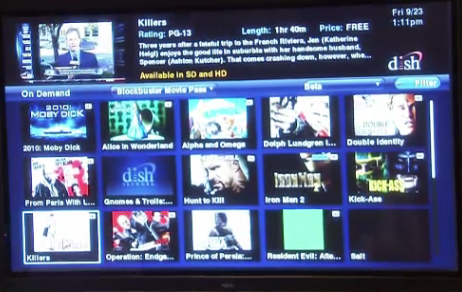 You’ll also have 4,000 movies and TV shows available to stream to your computer. And depending on where you access these titles, they might be mixed in with VOD (video on-demand) content, meaning content you have to pay for on an à la carte basis. 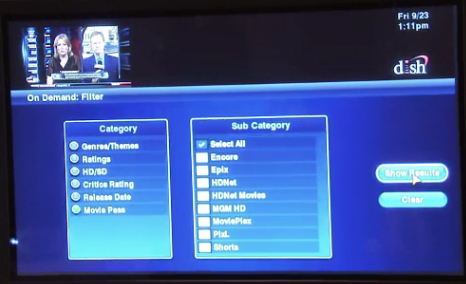 In addition to streaming, subscribers gain access to DVDs and video games by mail. The company has not changed any aspect of this service–it’s the exact same as the offering currently available on Blockbuster.com. (Only, it seems, you’ll adjust your queue from DishOnline.com for this plan.) In-store exchanges are available, too, meaning you can take a mailed DVD to the store, exchange it for a new title, and then, once that’s returned, resume the content you’ve loaded into your by-mail queue. It signals just how much Dish is committed to keeping the same brick-and-mortar policies that led to such success (see: bankruptcy) for Blockbuster. The one feature missing which many had hoped for? A standalone subscription streaming service that could be packaged with a Blockbuster by-mail subscription–an apples-to-apples Netflix competitor, in other words. Several journalists and analysts in the audience asked why this plan was not available. Blockbuster could only say that there may be an announcement on that in the future. “We think the ideal product is the integrated product–this is a Dish Network integrated product,” said Dish chief marketing officer Ira Bahr. Of course, “all of the above” is quite an expansive value proposition. For $50, as we’ve tried to describe, you gain access to 250 channels from Dish’s “America’s Top 200” package; live TV and additional on-demand content via DishOnline.com; streaming subscription content via the Blockbuster Movie Pass; DVDs and video games by mail, with in-store exchanges at Blockbuster brick-and-mortar stores; as well as VOD titles available for an à la carte price. “We’re totally focused on the needs of our consumers and the vulnerabilities of our competitors,” Clayton said. Did Clayton miss the recent news? Netflix customers became disenchanted because of price hikes and poor communication pertaining to its rebrand and offerings. So, Dish has responded to those vulnerabilities by creating a more complicated and confusing offering, which costs significantly more money? Just imagine how customers who, already upset with Netflx for raising prices by $6, will respond to Dish’s price point, which amounts to a $40 price increase! Even though Clayton began by saying the company has recognized changes in customer behavior and technology, his company’s strategy is entirely tied to cable TV (overlooking the predicted trend of cord cutting) and brick-and-mortar stores (ignoring, well, just about every digital trend out there). So while consumers find it seriously controversial that Netflix, adapting to industry trends, is spinning off its DVD business, Dish and Blockbuster are not even willing to risk divorcing the Blockbuster brand from pay TV or store-based outlets.